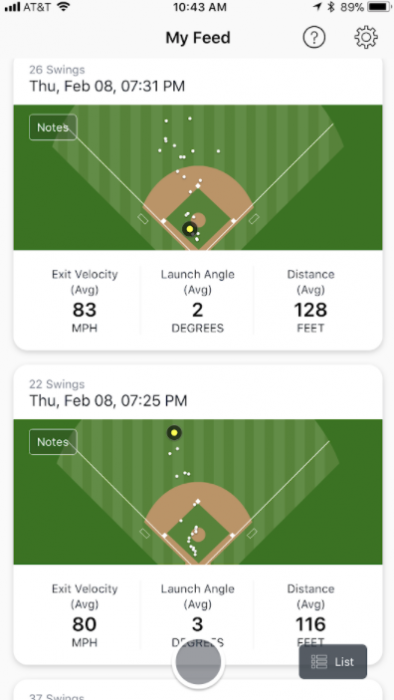 The Blast Vision App is software that uses your phone’s camera to plot the distance, speed and launch angles of your baseball and softball tee hits. Aggregating this data at your finger tips for immediate feedback sufficiency justifies the nominal price. We found the data to estimate ball exit speeds 8 to 10 miles per hour faster than MUCH more expensive systems like HitTrax. Despite that, we think the data useful and repeatable enough to measure hitter progress, success and simply increase the fun in hitting from a tee. Get the Blast Motion App on the Apple Store. 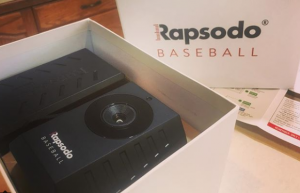 Just Bat Reviews uses Rapsodo in our exit speed testing. Rapsodo is considerably more expensive, but also allows us to track bat performance from the impact of a pitch. Ball flight metrics from a tee, although useful for hitter feedback and progress tracking, fall short of useful bat comparison analysis especially when considering multiple bats across multiple hitters across multiple days of work. In other words, the Blast Vision is a useful tool for what it is, but a robust bat exit speed tester it is not. 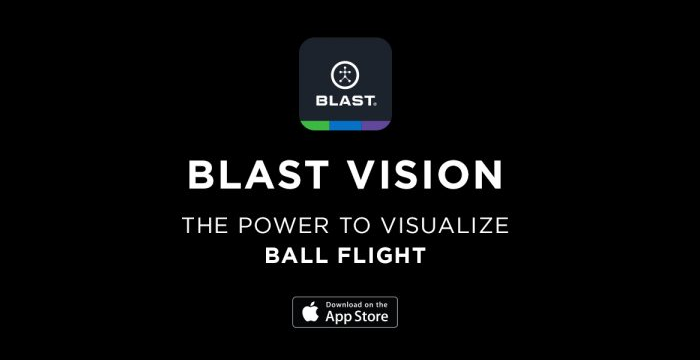 Blast Vision uses your iPhone or iPad’s camera to measure and track the ball flight off the tee. The device (iPhone or iPad) is set up parallel to the player and tee about 3-4 feet in front of and about 6-12 feet away with the ball lined up at one end of the screen. Hit record, tell it how far away it is from the tee and you’re ready to go. It will record all swings during your session, until you hit the stop record button. (The app works independent of the Blast Motion sensor which focuses on bat speeds and launch angles). There a lot of things to like about Blast Vision and we will get right to the most important, cost. While it does similar things to the Rapsoda and Hit Trax it doesn’t do them quite as well or with the same level of in-depth metrics. But, it costs only a fraction of the price. After a 2 week free trial of the app, you have the option to purchase it for $10. While $10 is a fairly steep price for an app, we think it is worth it. Blast Vision is simple and easy to use. It took us only a couple minutes the first time to get started but did take some tinkering to get it working more efficiently due to the environment where we set up the tee. Not only does it provide instant communication of the results of each swing (both visually and auditory), it video records each swing you take. We used a bluetooth speaker hookup so we could hear the readouts after each hit , rather than having to go over and check each swing on the screen. Blast Vision also tracks where each hit would go as well as the distance and displays them on a spray chart. Using that chart, you can then select an individual hit and look at the metrics for that specific swing. We tended to see a high concentration of hits up the middle as opposed to pull or opposite field hitting on the spray chart. It is hard to say whether the app struggles with direction accuracy because of its placement and limitations, or if our hitters were hitting more up the middle (which tends to happen off the tee). 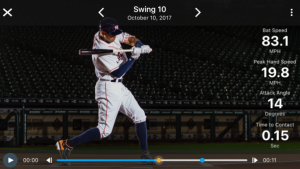 One of the truly outstanding features of the app is its ability to record each and every swing the player takes and play it back in controlled slow motion. We found this was very helpful, especially to compare swings with better results versus swings that didn’t produce the results we were looking for. The only drawback to this feature is that the device needs to be pretty much at the maximum of 11-12 feet away from the hitter to see all of their swing in the frame. At 9-10 feet away we got video of just the swing finish on the front side. Using the device at the farther distance can be difficult in cramped or confined spaces. We ended up rearranging a little (hitting in the basement) to be able to back the camera up to take full advantage of this feature. Another of the features we have found useful is the ability to label and take notes on sessions in the app. We have used this feature to label who was hitting and with what bats so we could go back over them and compare the results on which bats had higher exit velocities. Maybe more appropriate than calling them weaknesses, is to indicate that there were nuances we had to work around to fully obtain the advantages of the app. First is that it is very helpful to have a tripod for your device. While, we had a tripod, we had to wait on shipping for the iPhone attachment (approximately $7), so our early sessions were done without one. We were able to make it work by setting the phone on furniture, but even the slightest movement messes with the accuracy and can cause it not to record each swing. Not a big deal for us as we had the tripod, but something to consider in making a purchasing decision. Early on, we also experienced difficulty with it missing swings quite a bit. We suspected this was the result of poor lighting conditions, and after upping the brightness in the unfinished basement we solved this problem. Blast Vision also requires newer phone technology to be able to process. This means that our iPad Air did not have enough power to properly run the app. Neither did an older iPhone 6. We have to run it with our iPhone 7+ which means we are without our phone during hitting sessions. We also found that the readings tend to be a little inflated when comparing the same hitters results from both the Blast Vision sensor and hitting with a Hit Trax. It seemed that exit velocity was increased by about 8-10 mph. We don’t consider that such a bad thing as long as we are aware of it. It seemed to increase our player’s confidence a little and give him goals to work towards. 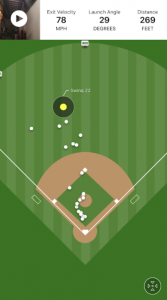 Blast vision also works from pitches on a tee. Platforms like Rapsodo and Hit Trax allow you to use it during live pitching. For a true analysis, especially when comparing bat pop performance, we think that much better. But, as we’ve stated above, those devices are much more expensive. Is Blast Vision Worth it? Although the data appears to be skewed a bit high compared to HitTrax (as it was in our test) we can use the data captured in the app, relative to each other, in perspective. With that in mind, we think the app is well worth the $10. Even if you include the cost of a tripod you may not have. We have also found the players look forward to hitting off the tee a little more and have some fun with it. Blast Vision is easy and intuitive to use and can become one of the better development and tracking tools you can have, especially in that price range. I agree with everything about this review. Im using the app with an ipad on a tripod. The launch angle is right on. The line the app drawn on screen follows the ball precisely. But the exit speed seems inflated for hitting a stationary ball off a tee. The exit speeds seems more in line with a pitched baseball. So I go with that in my head. The video is great for swing analysis and makes tee work fun. My 9 year old loves that it reads the statistics to you after every swing. if you already own a compatible ipad/ipod its well worth 10 bucks.